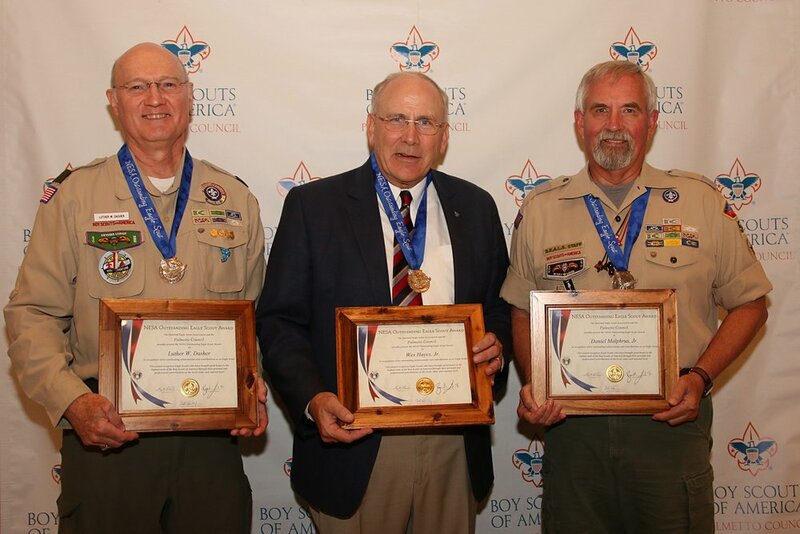 On June 24, 2017 the Palmetto Council National Eagle Scout Association (NESA) Chapter honored Luther Dasher, Robert "Wes" Hayes Jr. and Daniel Malphrus Jr. with the NESA National Outstanding Eagle Scout Award. The NESA Outstanding Eagle Scout Award (NOESA) is a prestigious recognition granted by the local council’s NESA chapter to Eagle Scouts who have demonstrated outstanding achievement at the local, state, or regional level. Since the award's inception in 2010, the Palmetto Council NESA Chapter has awarded the recognition to six outstanding Eagles. Luther Dasher, a native of Savannah, GA. Started his scouting career as a Cub Scout in the Coastal Empire Council in Garden City, GA, Pack #823. He moved on to Boy Scouts with Troop #23 sponsored by Chapel-In-The-Gardens Presbyterian Church in the same council. Luther was a member of the Order of the Arrow; he earned his religious emblem, Pro Deo et Patria in 1969 and earned his Eagle rank in October of 1970. Luther went on to Newberry College and earned his Bachelors of Science in Chemistry followed by a trip to UNC Greensboro where he earned his Master's Degree in Organic Chemistry. Luther has been a Research Chemist, IT Manager, & a Regulatory Manager. He has done all of this with his wife, Diane, by his side supporting him. Along with 2 children Rachel & Gregory (who is also an Eagle Scout). Luther has been a Den Leader, Assistant Scoutmaster, Scoutmaster, & is currently the Eagle Scout Coordinator with Troop 250 in Fort Mill, and I’ll come back to that in a minute. As an adult leader he took a contingent to the Florida Sea Base back in 2001. He has earned the Scoutmaster Award of Merit and the District Award of Merit. Luther’s most memorable moment as an adult was presenting an Eagle Award posthumously. When asked what 1 thing stuck out in his mind as most memorable as a youth in scouting that the boys today would not believe was he got kicked out of a water polo game at summer camp and the game was subsequently called! Luther’s actions show he continues to see the value in mentoring. He has personally mentored over 100 scouts from Life to Eagle. Knowing, that alone, he has had and caused a positive impact on hundreds of lives directly and indirectly over the years. When asked, the leaders of troop 250 described Luther as an indispensable mentor, friend, & role model of a man who directly influences the success of his troop and sets the bar high for the next generation of leaders. Luther, Thank you for all you have done and continue to do for your community; Congratulations Luther Dasher! Wes Hayes, a native of Rock Hill, SC. Started his scouting career as a cub scout at Oakland Avenue Presbyterian Church. Then moved to Troop 60 at First ARP church. He was a member of the Order of the Arrow. Wes earned his religious emblem around 1967 after earning his Eagle rank in 1965. In 1969 he also attended the National Jamboree. Wes went on to the United States Military Academy at West Point and earned his Bachelor's Degree. He enlisted in the Army and then the Army National Guard and retired as a Colonel. He also attended the University of South Carolina where he earned his Juris Doctor degree or Law degree. Wes is currently an Attorney and former member of the South Carolina Legislator. He did all of this with his wife, Sally, standing with him. Also, there was Wes, Creighton, & Margaret their 3 children (Creighton also an Eagle Scout). Wes got back involved with scouting by getting involved on the district level and council level. He has been the District Chair of the York District and the Council President. Currently he is on the Advisory Board for the Palmetto Council. Wes’s most memorable moment as an adult in scouting was in 2002 when he went to Philmont and hiked with his son Creighton. While working with the district and the council Wes has had a huge impact on the finances of the Palmetto Council which has enabled many improvements at Camp Bob Hardin. Wes enabled many youth to attend camp and be a part of the scouting program that would have been financially unable to without the work he has done. Wes Hayes, thank you for all you have given to this community. Congratulations Wes Hayes. Dan Malphrus, a native of the upstate. Started his scouting career in the Clemson area with Pack 30 in the Blue Ridge Council; moving to Troop 161 sponsored by Clemson Methodist Church (same as Pack 30). Dan Earned the Rank of Eagle in October of 1964. Dan served our country in the Army as an Infantry Officer. While in the Army he spent time in the Republic of Vietnam serving the United States in 1971. When Dan finished his Army Career he retired as a Colonel. Dan received a degree in Animal science from Clemson University in 1969. He has been a Realtor, a Banker, a Carpenter, and we all know him in his current role Judge/Magistrate for the last 25 years. He did not do all of this alone. He is accompanied by his wife, Cynthia, of 46 years and 3 Children, Elizabeth, Rebecca, & Jonathan. That alone sounds like a full busy life, but not for Dan. He got back involved with Scouting and was a Den Leader, Assistant Pack Leader, Scoutmaster, Council Cope Director, on the Council Training Team, Boy Scout Roundtable Commissioner, District Advancement Chair, and York Chapter Order of the Arrow Advisor (Where he is a Vigil Honor Member). He is a member of the FOX PATROL from the Wood Badge class SR-182. Dan has staffed Introduction to outdoor leadership training, SEALS Staff, NYLT Staff, Wood Badge Staff, and National Camping school staff. He currently is a troop committee member with Troop 108 in Fort Mill, SC. He has been awarded the Scoutmaster Award of Merit, the Palmetto Award, and The Silver Beaver Award. When asked what was one memorable thing you did in scouting as a youth, boys today wouldn’t believe; Dan’s answer, he chewed 22 pieces of Bubble Gum at 1 time. Dan’s actions show he has always seen the value in mentoring & training youth and adults to become role models for other youth in our community. Dan has personally affected hundreds if not thousands of youth in our area being involved in the many roles he has had in scouting. He is the true definition of what it means to give back. Congratulations Dan Malphrus!